Nonstick cookware has been a real time saver in our kitchens. Unfortunately there’s some serious health concerns associated with Teflon and in particular a chemical that it releases in certain conditions called PFOA. Here’s what you need to know about this toxic substance and how to avoid it while still using nonstick pans to cook with. Perfluorooctanoic acid or PFOA is a polymerization aid that has been used for many years in the manufacture of nonstick cookware. While its use is slowly being phased out, unless you’ve recently purchased cookware that is specifically labeled PFOA-free, then it’s likely that the nonstick pans in your kitchen are a source of this potentially dangerous chemical. PFOA and other hazardous toxins have been shown to be released from nonstick cookware when heated to high temperatures. 680 degrees Fahrenheit is often cited as the temperature at which toxic gases are easily detectable from Teflon coated pans, though airborne particles have being measured as low as 464 degrees Fahrenheit. These kind of temperatures aren’t that hard to reach if you leave a pan on the hot plate for a while or heat it up on a high setting. Contrary to popular belief, you don’t actually have to use metal utensils on your nonstick cookware for it to be dangerous. While I definitely wouldn’t want to eat Teflon particles, PFOA and other harmful gases are released due to high temperatures, regardless of whether your frying pan or saucepan is chipped or scratched. PFOA and other chemicals in Teflon coatings have been labeled as ‘likely to be carcinogenic to humans‘ by a panel reporting to the Environmental Protection Agency. 2010 research found higher blood levels of PFOA to be associated with a greater risk of thyroid disease – a serious health issue that has skyrocketed in recent years. Studies have also linked exposure to the chemical to a higher risk of heart disease and stroke, even at relatively low levels. 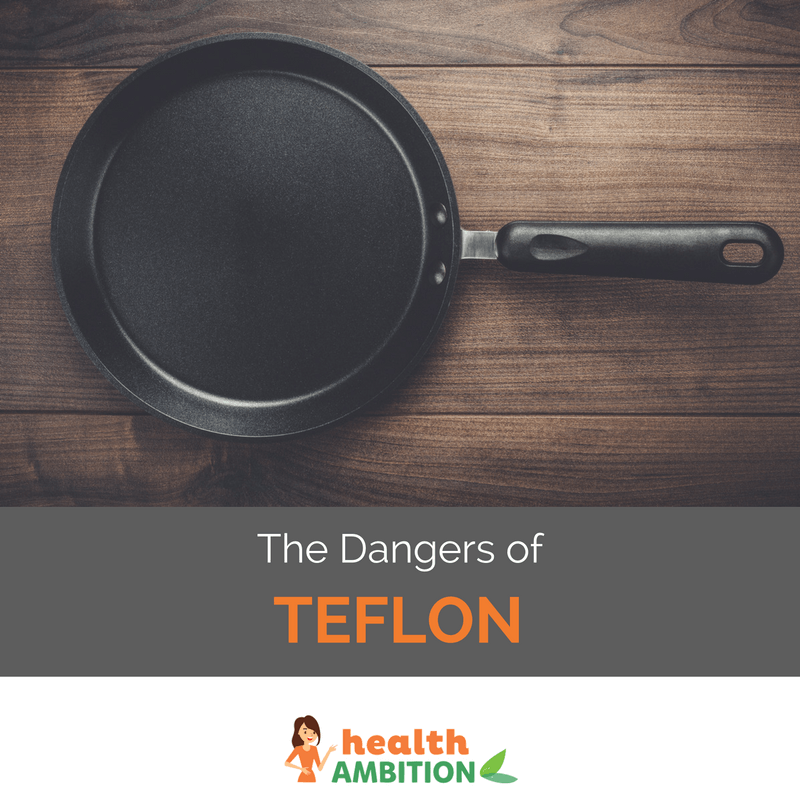 These are longer-term serious health concerns, but heated Teflon can have a more immediate effect on your body. High-temperature cooking with these type of pans can lead to a condition known as ‘Teflon flu’ from inhaling the gases released over your hot plate. Symptoms of Teflon flu are actually said to be quite similar to suddenly developing influenza, with headaches, chills and fever, along with coughing and chest tightness most commonly reported. Because Teflon flu usually develop several hours after exposure to offgassing nonstick pans, very few people would make the association. The temperatures involved are relatively high at above 500 degrees Fahrenheit (260 Celsius), but not that difficult to reach if heating a pan up to sear a steak in for instance. Testing by DuPont, the manufacturer of Teflon, showed birds died from exposure to the gases from nonstick cookware at just 536 degrees Fahrenheit. Clearly keeping the temperatures down when cooking with nonstick cookware is much more important than most people realize. Teflon flu, or ‘polymer fume fever’ as DuPont likes to call it, is a dramatic example of what high levels of exposure can do to your body. While you may not have experienced such extreme symptoms, PFOA is a very persistent chemical and once in your body it is difficult to get rid of and builds up over time. Estimates of 98% of the US population having detectable levels of PFOA show just how pervasive this chemical is. Given that, it’s far better to start reducing your exposure from your pots and pans today. Let’s have a look at how. Here’s an interesting video related to teflon. With the dangers of Teflon becoming more widely known, many people have wanted PFOA-free pans to cook with. Old cast iron cookware does not have the same health concerns, but it is of course much more difficult to clean and a bit of a nightmare once food gets burnt on. A better alternative to Teflon, that I use in my own kitchen, is new nonstick ceramic cookware. After looking around for a while, I chose this new ceramic set that is 100% PFOA and Teflon free. While still nonstick, they are far more scratch resistant than Teflon and have a very high heat resistance of 850 degrees Fahrenheit or 450 Celsius. The ceramic coating is also said to be a better heat conductor than traditional cookware coatings and does not contain any toxic chemicals or pollutants. If you only use your frying pan for high temperature cooking then ceramic 2 set is good value for a positive change in your kitchen. I’d still advise against cooking your food at really high temperatures or chipping away at cookware coatings with metal utensils, but ceramic cookware does seem to be the future of nonstick cooking. If you’re still using those old nonstick pans, with all of the Teflon dangers that have come to light in recent years, it could be well worth the upgrade. What is the Best Forehead Thermometer in 2019? I am wondering if you have any information or opinion on the use of overnliners that contain PTFE. I purchased a Chef’s Planet overliner for my oven. Its purpose is to catch drips and keep and bottom of your oven cleaner for easier upkeep. However, after I purchased it, I realized it is made of PTFE coated fiberglass. I love the idea of the product, but I don’t want to increase exposure to toxic substances in my family. We bake a lot, mostly at 350 degrees. I’ve read a little about non-stick pans and the surfaces releasing toxic fumes at higher heats, so now I’m questioning whether I should use this liner. Any input would be appreciated. Thank you. Hi Susan and thanks for your question. What is your opinion on non-stick pans like Stonewell, Stonedine and Flavorstone etc.? Would they be as good as the ceramic cookware you recommend? To me, non-stick cookware has always been a solution to a problem that never existed, and a great way for makers to get consumers to have to spend money multiple times instead of buying one set of good cookware for life. I think with the shift in economics, consumers are starting to see the light and realize that one good set of cookware is cheaper than periodically replacing mediocre sets. I’ve been using All-Clad for over a decade and have been using the same pots and pans once or twice a day for the past 5,000 or so days. I put them in the dishwasher. I beat on them with metal utensils. I have dropped them on stone floors. I clean them with acid, certain abrasives, and restore shines with heavy polishes and a Dremel. I use them on gas, electric, induction, over an actual coal fire, in ovens, etc. You name it. They look like they did in early 2000. I also agree with the need for medium or low heat given with SS, not putting food on until after preheating and the food sizzles upon immediate surface contact creates a natural barrier between the base of the cookware and the food. I do like many of the ceramics you are discussing, plus enameled iron, but my primary complaint is that they still don’t have anywhere near the durability of clad. I want one cooking set that will last 50+ years, give fantastic heat transfer, and be able to withstand heavy usage and cleaning with aggressive compounds. T316TI Stainless Steel metal used by Saladmaster, they claim it is the best metal used for cookware they are selling. What does M18/10 stainless steel & M18/8 metal stands for ? I attended one demo from them, they claim their material is non-reactive to the food ( The metal T316Ti they use) . I searched online for some other cooking products who use T316 stainless steel. Which is better?